CSWS first described by Peter et al. in 1950 is defined by the development of excessive natriuresis and subsequent hyponatremia, dehydration in patients with intracranial disease. Though many hypotheses have been given, but the exact mechanism of CSWS is not known. We conducted this study in a tertiary care hospital to determine the incidence and etiology of hyponatremia in patients of stroke admitted in the hospital. It was a prospective study performed over a period of 2 years that included established cases of stroke diagnosed on the basis of clinical history, examination, and neuroimaging. A total of 1,000 stoke patients were evaluated for hyponatremia (serum sodium <130 meq/L). All the patients were assessed for volume status. Serum sodium, serum osmolality, urinary sodium, and urine osmolality was also measured. All those patients who had a history of gastroenteritis, head trauma, brain tumor, pulmonary kochs, bacterial pneumonia, bronchogenic CA, leukemia, lymphoma, recent surgery and intake of drugs that can cause hyponatremia were excluded from this study. 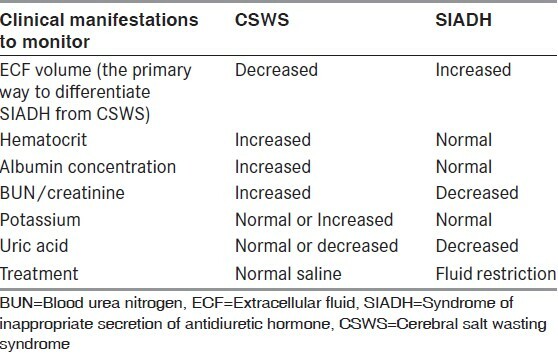 SIADH was differentiated from CSWS as per [Table 1]. The data were analyzed using the Chi-square test using the SPSS (Statistical Package for Social Science) Software. Out of 1,000 patients, 353 patients had hyponatremia. Out of this 353 patients, 238 (67%) had SIADH and 115 (33%) had CSWS. SIADH was seen in 83 patients who had an ischemic stroke and 155 patients of hemorrhagic stroke. CSWS was found in 38 patients with ischemic stroke and 77 patients with hemorrhagic stroke [Table 2]. [Table 3] shows distribution of Hyponatremia in hemorrhagic stroke as per site of hemorrhage. The distribution of Hyponatremia in Ischemic stroke as per vascular territory involved is shown in [Table 4]. Out of 353 patients with hyponatremia with stroke, 197 survived and 156 died. Out of 647 patients without hyponatremia, 553 survived and 94 died. The P value for this was 0.00 which is statistically significant. In the SIADH group of patients ( n = 238), 129 survived while 109 died, whereas in the CSWS group of patients ( n = 115), 68 survived and 47 died. On statistical analysis, it was found that CSWS significantly affected the outcome of stroke. The symptoms directly attributable to hyponatremia primarily occur with acute and marked reductions in the plasma sodium concentration and reflect neurologic dysfunction induced by cerebral edema and possibly adaptive responses of brain cells to osmotic swelling. Hyponatremia induced cerebral edema occurs primarily with rapid (over 1 to 3 days) reductions in the plasma sodium concentration. The severity of symptoms generally reflects the severity of cerebral over-hydration. Nausea and malaise are the earliest findings, and may be seen when the plasma sodium concentration falls below 125-130 meq/L. This may be followed by headache, lethargy, and obtundation and eventually seizures, coma, and respiratory arrest if the plasma sodium concentration falls below 115-120 meq/L. Non-cardiogenic pulmonary edema has also been described. SIADH tends to occur in three disease groups; Central nervous system (CNS) disorders, carcinomas, and pulmonary disorders. It can also occur due to many drugs such as analgesics, antidepressants, barbiturates, carbamazepine, and oral hypoglycemic. Patients with SIADH are usually euvolumic and hypertensive. Neurologic signs to look for in patients with SIADH include drowsiness, seizures, and coma. CSWS is defined as "true hyponatremia," which occurs when there is a primary loss of sodium into the urine without an increase in total systemic volume. The exact mechanism that causes CSWS is unclear, but one hypothesis states that it is due to an exaggerated renal pressure natriuresis that occurs from increased sympathetic nervous system activity. The following [Table 1] shows the features that help in differentiating SIADH from CSWS. Making the distinction between SIADH and CSWS is important as the treatment is different in the two conditions. SIADH is treated by restricting fluids and drugs such as furosemide, demeclocycline or lithium. CSWS is managed by treating the underlying cause, volume replacement with normal or hypertonic saline and drugs like fludrocortisones. One study performed previously in critically ill adult neurological patients found hyponatremia in 1-15% of the patients, which was associated with a mortality increase of 7-60%. In another study, hyponatremia in the acute stroke stage was seen in 11.6% of cases and has been found to be a predictor of 3-year mortality in patients with acute first-ever ischemic stroke. We studied 1,000 patients of stroke out of which 353 patients were having hyponatremia giving incidence of 35% approximately, which is more than what was found in a previously done study. Out of 353 patients with hyponatremia with stroke 197 survived and 156 died. Out of 647 patients without hyponatremia, 553 patients survived and 94 died. Statistical analysis revealed that hyponatremia significantly affects the outcome of stroke especially when it is due to CSWS rather than SIADH. Incidence of hyponatremia in our study population was 35%. 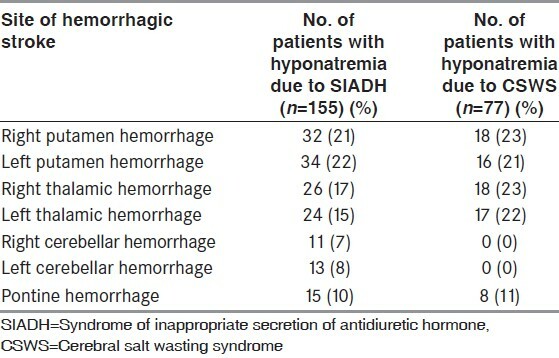 In patients of hyponatremia, 67% were having SIADH and 33% were having CSWS. Overall hyponatremia affected the outcome of stroke especially when caused by CSWS. Therefore, close monitoring of serum sodium must be carried out in all patients who are admitted with stroke and efforts must be made to determine the cause of hyponatremia, in order to properly manage such patients thereby decreasing the mortality rate. 1. Bussmann C, Bast T, Rating D. Hyponatraemia in children with acute CNS disease: SIADH or cerebral salt wasting? Childs Nerv Syst 2001;17:58-62. 2. Palmer BF. Hyponatremia in patients with central nervous system disease: SIADH versus CSW. Trends Endocrinol Metab 2003;14:182-7. 3. Coenraad MJ, Meinders AE, Taal JC, Bolk JH. Hyponatremia in intracranial disorders. Neth J Med 2001;58:123-7. 4. Rabinstein AA, Wijdicks EF. Hyponatremia in critically ill neurological patients. Neurologist 2003;9:290-300. 5. Palmer BF. Hyponatraemia in a neurosurgical patient: Syndrome of inappropriate antidiuretic hormone secretion versus cerebral salt wasting. Nephrol Dial Transplant 2000;15:262-8. 6. Alam MN, Uddin MJ, Rahman KM, Ahmed S, Akhter M, Nahar N, et al. Electrolyte changes in stroke. Mymensingh Med J 2012;21:594-9. 8. Peters JP, Welt LG, Sims EA, et al. A salt-wasting syndrome associated with cerebral disease. Trans Assoc Am Physicians 1950;63:57-64. 9. Lath R. Hyponatremia in neurological disease in ICU. Indian J Crit Care Med 2005;9:47-51. 10. Tisdall M, Crocker M, Watkiss J, Smith M. Disturbances of sodium in critically ill adult neurologic patients: A clinical review. J Neurosurg Anesthesiol 2006;18:57-63. 11. Huang WY, Weng WC, Peng TI, Chien YY, Wu CL, Lee M, et al. Association of hyponatremia in acute stroke stage with three-year mortality in patients with first-ever ischemic stroke. Cerebrovasc Dis 2012;34:55-62.